Fresh Blends NW Presents: Curried Carrot Cake Ingredients (organic preferred): 1 Cup Brown Rice Flour 1 Cup Coconut Flour 1 Cup Sugar 1/2 teaspoon Salt 2 Cups Grated Carrot 3/4 Cup Raisins 1/2 Cup Grated Pineapple 1/2 Cup Crushed Walnuts 1 Packet Masala Magic Curry Powder Blend, put into oiled pan Cook at 350° F for 45 Minutes Frosting! 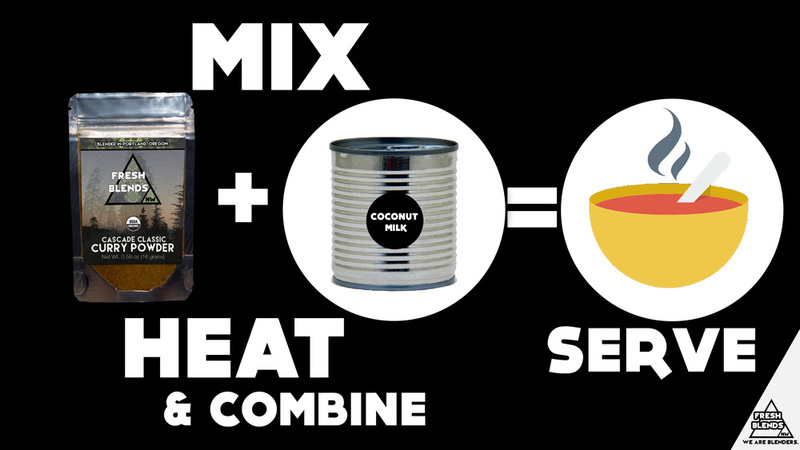 In a saucepan Mix together 1 packet of Fresh Blends Curry Powder and 1 can of coconut milk. bring to a Simmer for 5-10 minutes. Combine with your favorite protein, add your favorite cooked veggies and serve over rice or quinoa.